In the previous EUR/USD forecast we noted that we might see 1.28 if bearish pressure continued. The SMA 200 in the area might serve as a support. Sentiments seemed to be swinging low and risk aversion appeared to be encroaching. 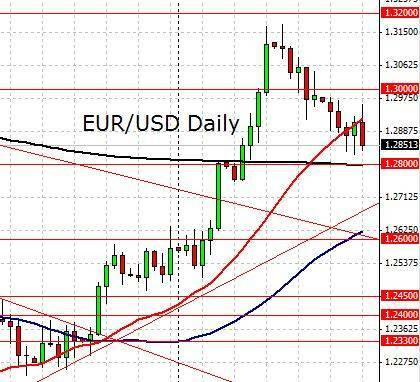 Looking at the EUR/USD daily chart above we note that the bearish pressure did crush the 1.3 line and sent the currency pair towards the 1.28 support. While both SMAs remain bullish, we should monitor 1.28. The SMA 200 ( BLACK ) usually functions as a support of sorts and if it fails together with 1.28 due to overwhelming bearish pressure, the next bearish target will be 1.26 which will mark a reversal of the previous bullish rally. In the previous AUD/USD forecast we noted that the currency pair was knocking at the 1.0430 support’s door. Spanish bailout rumours and more were dampening sentiments and exerting a downwards pressure on the currency pair. The short term trend seems to be bearish as the global markets continue to be affected by apprehension. I expect the 1.0330 to continue to offer a support of sorts but if the bearish trend intensifies, 1.02 may be the next extended bearish target. Needless to say, a bullish come back will open up 1.0430 and then the next upper resistance as seen above. The GBPUSD regained its bullish momentum yesterday and hit 1.6256 earlier today. The bias is bullish in nearest term but note that price is still moving sideways without significant bullish breakout so far and need a clear break at least above 1.6300 to continue the bullish scenario after break above the trend line. Immediate support is seen around 1.6200. A clear break below that area could lead price to neutral zone in nearest term but as long as stays above the trend line and 1.6150/35 I still prefer to buy on dips. The USDJPY didn’t make significant movement yesterday but overall still able to maintain its bearish bias and still making lower lows and highs. There are no changes in my technical outlook. The bias remains bearish in nearest term testing 77.10 area. Immediate resistance is seen around 77.90 followed by 78.20. Potential weekly range remains between 79.70 – 77.10. Overall I still prefer a bullish scenario due to a good risk-reward ratio near the record low at 75.56 and consider 76.00 – 77.00 area as a good place to buy for long term trading plan. The USDCHF had another indecisive movement yesterday. The bias is neutral in nearest term but as long as stays below 0.9420/35 I still prefer a bearish scenario. Immediate support is seen around 0.9300 followed by 0.9250 which are the nearest bearish targets. On the upside, a clear break and daily close above 0.9420/35 (daily EMA 200) will interrupt the bearish scenario and activate my bullish intraday mode. Euro saw turn-around in miiday New York trade with daily candlesticks closing back above the 21D EMA suggesting a possible bounce from the EMA lines in daily charts. From indicators we have mixed signals as stochastic comes off oversold levels while macd remains bearish. Note we are just above the 23.6 Fib of our sell-off from September 17. In intraday charts we have a confluence of buys from the 4H picture with stochastic pushing overbought and macd’s pointing up while hourly charts are similarly situated. Immediate risks calls for further gains though we have moderate resistances at 1.2959. Look for consolidation or reversal signals from the 1.2959 area, 38.2 Fib of the down swing before considering taking the sell side from the area. Kiwi us just under a moderate resistance and the highs for the range play the past two weeks. This following a bounce off the EMA lines Wednesday and the 38.2 Fib retracement of the rally from September 5. Daily indicators are now showing a bullish stochastic while macd’s remain flat. In intraday charts we have a confluence of buys from the 4H picture with stochastic overbought and macd’s pushing higher. Hourly charts for their part are mixed with stochastic bullish and macd’s with a bear cross. At this point immediate risk appears to call for a push past 0.8323 with an hourly close above the said price likely to see the start of an up leg for the years highs. Following the midday bounce in US equities we saw Cable pushing back up after a whipsawish trade in Europe to close inside the range of the tight real bodies from the previous week’s range play. Among indicators we have mixed signals with stochastic pushing higher and macd’s dropping. In the lower time frames we have 4H stochastic in overbought levels while macd is pushing higher. Hourly charts for their part has a bullish though flat macd and a new bullish crossover from stochastic. Note this is the final trading day for the quarter with a rally for much of the past three months and little pullback, cyclical risk suggests position squaring pressure. Look for shorts from at least under 1.6267 preferably off 1.6300(09). The daily EMA lines failed to contain the rally following our hammer from Wednesday giving us a big white candlestick with price action suggesting a further rally. At this point we have prices testing the moderate resistance at 1.0441(49) while indicators are mixed from the daily picture with stochastic heading up and macd’s flat. From the lower time frames we have seen a shooting star in 4H charts from New York trade with indicators looking mixed as stochastic tries to come-off overbought levels while macd is rising. Hourly charts has a bullish stochastic and a flat macd. Given the mixed signals we prefer remaining sidelined with a break of 1.0449 still needing a confirming candle for a play. Look for possible shorts coming off the 61.8 Fib at 1.0511(18). The EURUSD was indecisive yesterday. The bias is neutral in nearest term but overall remains in bearish phase after formed double top formation and still making lower highs and lows, challenging the lower line of the bullish channel. As long as moving inside the bullish channel I still prefer a bullish scenario. Immediate resistance remains around 1.2950. A clear break and daily close above that area would interrupt the current short term bearish phase testing 1.3000. Immediate support is seen around 1.2850. A clear break below that area would keep the bearish phase remains strong testing 1.2800 – 1.2750 region.